A new state water quality-related record has been set, and it is likely the number will continue to climb in the coming weeks. Today, DNR issued two beach advisories warning Iowans to stay out of the water at two State Park beaches due to high levels of microcystin, a toxin produced by blue-green algae blooms that can make people sick. This week’s advisories week bring the total number of microcystin warnings posted this year to 25, surpassing the previous record – 24 warnings – set in 2013. It’s likely we’ll continue to see additional beach warnings between now and Labor Day, the last week of the DNR beach monitoring program. 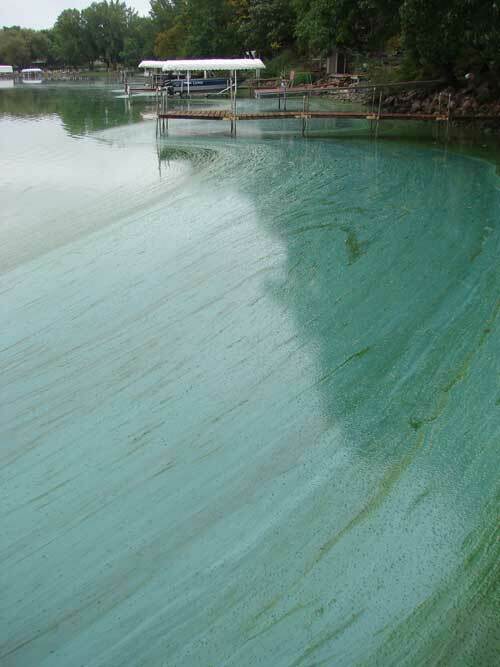 Blue-green algae, which is caused by a combination of high levels of phosphorus pollution and increased temperatures, has long been an issue in Iowa. However, in recent years, the high levels of microcystin in Iowa lakes and resulting beach warnings have been on the rise. Since 2006, DNR has issued 139* beach warnings for levels of microcystin exceeding 20ug/L, a level deemed unsafe by the World Health Organization. Nearly two thirds (91) of these warnings have been posted in the past four years. Additionally, more than half (23) of the 39 State Park beached monitored by DNR have made an appearance on the DNR warning list, many making repeat appearances. To reduce the occurrence of these harmful algae blooms we must reduce the phosphorus pollution coming from farms, city lawns, wastewater treatment systems that is feeding the algae. Failing to reduce these sources of phosphorus pollution not only puts our health at risk, but also threatens safe drinking water, has negative economic impacts on communities and our quality of life. It’s important to note that while DNR monitors State Park beaches for this toxin, the problem is not isolated to these lakes. Many other public and private beaches not monitored by DNR are also susceptible to blue-green algae blooms. Also, while swimming activities drop off after Labor Day, the danger of exposure to blue-green algae continues as long as the hot, sunny weather lasts, so the public must continue to be vigilant. Toxic blue-green algae blooms create blue to green murky water, visible surface scum and a foul odor. The blooms can spread across the water but tend to accumulate in shoreline areas. Contact with water at or above 20 ug/L can result in breathing problems, upset stomach, skin reactions, and even liver damage. Inhaling water droplets containing toxic blue-green algae can cause runny eyes and nose, cough, sore throat, chest pain, asthma-like symptoms, or allergic reactions. Earlier this summer, Iowa’s public health leaders announced plans to require doctors to report “microcystin-toxin poisoning” to the Iowa Department of Public Health. If you think you or your pets may have been exposed to toxic blue-green algae, thoroughly wash it off with fresh water. If you or your pet experience symptoms associated with high microcystin levels after suspected exposure, seek medical or veterinary care immediately. Weekly beach advisories can be found on the DNR website. Call the DNR Beach Monitoring Hotline at 515-725-3434 to report a potential blue-green algae bloom. Records showing State Park Beaches with documented Microcystin levels exceeding 20 ug/L dating back to 2006 are available on the Iowa Environmental Council’s website. *Excludes 2008 when beaches were not monitored due to a diversion of DNR resources to address extreme flooding in the state.